If you live in a cold climate, winter likely has you dreaming of somewhere not so wintery. Don’t get me wrong, I actually enjoy living in a climate with four seasons, including winter, but there are days that will leaving you feel like you can only handle so much. Managing winter is one thing, managing it with a young kid at home can make it seem twice as long and you need to come up with ideas to break the season up. Taking the family on a nice vacation somewhere for a week might be feasible for some, but others need to come up with easier, and cheaper ideas to break the cabin fever. If you’ve read any of my other blog posts you know I’m a huge lover of my local dollar stores. It satisfies many of my needs and cold winter blues is one of them. On bad winter days we usually head to the local dollar store to buy a new supplies to play with for the day. Today was a day off for me and we had no reason to leave the house except we started going a little stir crazy. Off to the dollar store we went. For $5.00 we bought some paint brushes (we couldn’t find a single one at home…), a paint tray and 2 canvases to use. Kiddo had received some paint for Christmas and we finally broke them out. While my daughter was painting in the kitchen, I decided to re-organize my spice cupboard with new containers I bought, again from the dollar store. Painting and organizing may not be for everyone but it was a great use of our day. When the weather is nice (by winters standards), we try and get outside. I enjoy winter activities when we can get out and kiddo loves it. Though we don’t do much beyond the building snowman and sledding at this age, soon we will be able to go skiing and other longer activities. Don’t let the weather scare you inside for months! Groupon can become your best friend. It is a great resource to find inexpensive days and nights out for yourself or the whole family. I have found a few great deals on events for myself and things for us to do as a family for cheap. A local indoor play park recently had a BOGO Groupon. This is not only one afternoon planned but two for cheap! It can also be a great spot to find gift certificates to eat out (which can get expensive with multiple mouths to feed). While I’m perfectly content staying in my own backyard in the summer watching kiddo run around, come wintertime I feel the need to get away from home and do stuff. If I’m not careful I could find myself wondering the halls of the mall, filling carts out of sheer boredom. With a little research and planning though I think we’ll get through the winter just fine without killing our budget. 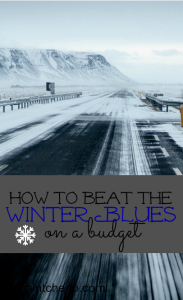 How do you keep the kids sane in the winter? What are your go-to activities?